Preterm birth is an increasing challenge in the developed and developing world. As we begin to understand what contributes to the likelihood of preterm birth, obstetricians and gynecologists can advise mothers and aspiring mothers on how to minimize the risks. Doctors can also monitor those patients who are likely to be at risk to increase the chances of preventing or effectively managing preterm labor. 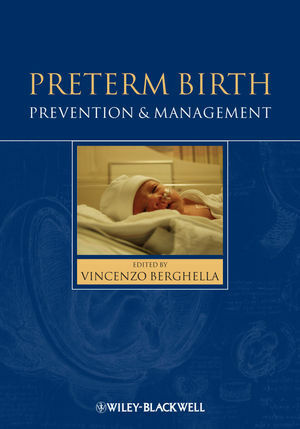 This practical book provides a clinically focused approach to the prevention and management of premature births, using the best available evidence to provide clear guidance to obstetricians, gynecologists, nurse midwives and family practitioners. Written for an international audience, the author addresses the special issues affecting patients in the developing world, including infectious- and poverty-related preterm birth. 1 The Global Impact of Preterm Birth (Jennifer Harris Requejo & Mario Merialdi). 2 Preterm Birth: A Complex Disease (Eric J. Hodgson & Charles J. Lockwood). 3 Why Prevention? (Jason K. Baxter). 4 The Epidemiology of Preterm Birth (Robert L. Goldenberg & Elizabeth M. McClure). 5 Genetics of Preterm Birth (Heidi L. Thorson & Hyagriv N. Simhan). 6 The Cervix (Vincenzo Berghella). 7 Infl ammation and Infection (Roberto Romero, Francesca Gotsch, Shali Mazaki-Tovi & Juan Pedro Kusanovic). 8 The Endocrine Regulation of Human Labor (Roger Smith, Julia I. Smith & Andrew M. Bisits). 9 Preventive Issues for All Gravidas (Priyadarshini Koduri). 10 Tobacco and Preterm Birth (Jeroen P. Vanderhoeven & Jorge E. Tolosa). 11 Care for Women with Prior Preterm Birth (Jay D. Iams). 12 Short Cervical Length (Timothy J. Rafael). 13 Fetal Fibronectin (Maria Bisulli). 14 Bacterial Vaginosis (Nancy W. Hendrix). 15 Sexually Transmitted Infections (Neil S. Seligman). 16 Multiple Gestations: Preventing and Managing Preterm Birth (Edward J. Hayes & Suneet P. Chauhan). 17 Asymptomatic Manual Cervical Changes (Leonardo Pereira). 18 Preterm Labor (Amen Ness, Yair Blumenfeld & Joyce F. Sung). 19 Preterm Premature Rupture of the Membranes (Brian M. Mercer). 20 Promotion of Fetal Maturation (Kellie E. Murphy). 21 Location, Mode of Delivery and Intrapartum Issues for the Preterm Gestation (Dana Figueroa & Dwight J. Rouse). 22 Perinatal Care and Long-Term Implications (Janet E. Larson, Shobhana A. Desai & William McNett). 23 Ethical Issues Related to Preterm Birth (Frank A. Chervenak & Laurence B. McCullough). 24 Future Research (Catherine Y. Spong).